By participating in an arts integrated PD experience, classroom teachers can eventually develop understandings of and skill with cultivating their students’ arts-based disciplinary literacies, and this begins by growing their own. DEFINITION: What is Arts Content Focus in an arts integration PD experience? The goal of arts integration, as defined by the Kennedy Center, is to “meet evolving objectives” in both the art form and another subject area (Silverstein & Layne, 2010). The strategies a teaching artist introduces to classroom teachers do not merely supply them with arts-based ways of accessing other content, but emphasize knowledge, language, skills and dispositions critical to success in the art form. Through a PD experience, the teaching artist has an opportunity to inspire classroom teachers to become arts enthusiasts and advocates of the arts. The teaching artist elevates each participants’ appreciation for art and the creative process. 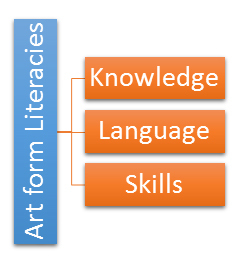 The unique set of knowledge, language and skills associated with each art form is the disciplinary literacy of that art form. For example, to become literate in dance, students develop knowledge of the elements and principles that guide understanding of quality achievement in and through the art. They need skill—a certain level of mastery over the technical standards of the art form. They strive to develop a refined sense of aesthetics through the quality of their movements. What’s more, students need language to reflect on, assess and describe what they have learned and what they can still achieve in and through dance. A similar set of literacies can be found in music, drama, and visual art. By participating in an arts integrated PD experience, classroom teachers can eventually develop understanding of and skill with cultivating their students’ arts-based disciplinary literacies, and this begins by growing their own. Classroom teachers also have a chance to expand their understanding of creativity during arts integration PD experiences. Arts integration tends to focus on the creative process, with an emphasis on student-centered choice, reflection, feedback, and revision. Classroom teachers who value this process invest in the planning and revising stages of art making, which can prove essential to students’ achievement of the arts-specific objectives of an integrated lesson or unit. PURPOSE: Why is Arts Content Focus important to an arts integration PD experience? Classroom teachers are usually well-versed in disciplinary literacies of academic subject areas such as math or reading, but may be less familiar with the knowledge and skills required of students to successfully master arts objectives. Even if they do value an arts discipline, classroom teachers may not feel confident to teach it. Also, the culture of many traditional schools does not support the exploratory time required for a creative process. In situations where outcomes are paramount, processes are often not given priority or seen as valuable. In contrast, a teaching artist who is immersed in his or her art form often engages in creative process intuitively. For a teaching artist, this expertise can be both a blessing and a curse. A blessing, because the artist has a wealth of specialized knowledge and skill to offer classroom teachers. A curse, because it can be challenging to return to the introductory steps required for developing the craft. Classroom teachers need to practice these introductory steps in order to facilitate them with their students. It becomes important, then, for the teaching artist to help classroom teachers clearly understand and develop facility with the knowledge, language and skills of a particular arts discipline, in order to effectively integrate the art into their teaching practice. I have been struggling with which fine arts standards to use when I write my unit lessons for this class. It just didn’t feel like any of them quite fit what I was trying to accomplish. However, today when our instructor passed out a Standards Connections sheet for fine arts and ELA things began to come into focus. 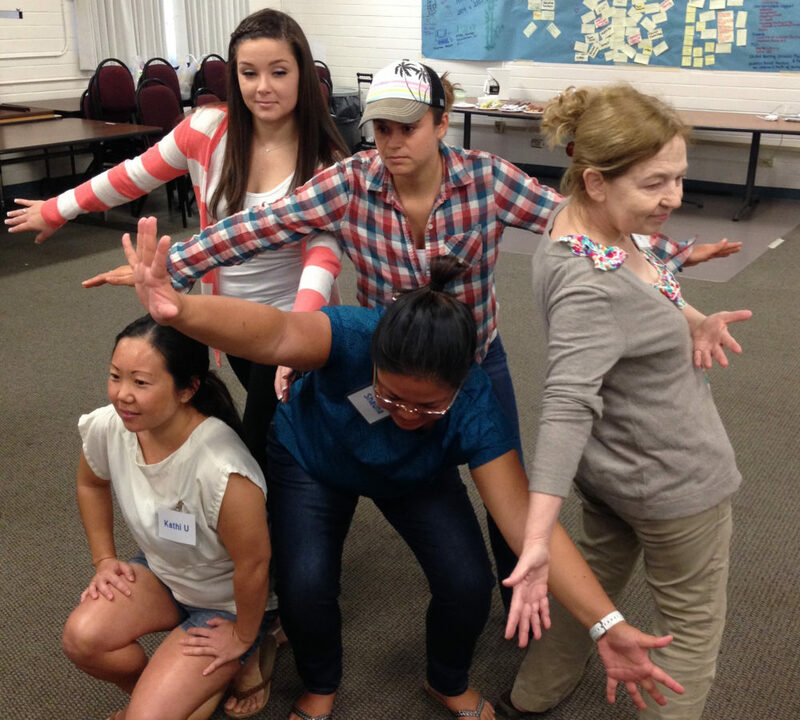 IN PRACTICE: How might Arts Content Focus be applied to an arts integration PD experience? Below are some ideas for building classroom teachers’ artistic literacy in a given discipline. These examples represent some ways teaching artists address the need to spark curiosity about and aesthetic appreciation of an art form. Exemplars: One way to emphasize the power of the arts—and a specific art form—is to show an instance of excellence. A sampling of dance from from Pilobolus or Black Grace might convey the potential impact human movement can have on an audience. A teaching artist who opens a PD experience by performing a spoken word piece might evoke powerful reactions and appreciation of an art form few teachers have seen in a live context. Working in a museum with an opportunity to interact within the galleries might have a similar effect. Before, during and/or after any exposure to great art, the teaching artist facilitates reflection about the experience and the tools of communication gained. Making the instruments and the science related to their construction. Creating a musical composition with the instruments that tells a story. The teaching artist leads classroom teachers through an abbreviated process that mirrors the work that students will engage in. In order for teachers and students to successfully complete the third component, performing their work, they will need to know the following art content and terms. Visual Support: Teaching artists often define the elements and principles of an art form for classroom teachers by providing visual supports or graphic organizers. Teachers use posters in classrooms to remind themselves of the important vocabulary of the disciplines, and also to support students’ use of that language. For example, a teaching artist might supply his or her participants with a poster of “Vocal Traits” or “Body Traits” during a drama PD experience. The “B.E.S.T. Elements of Dance” and the “Visual Arts Elements and Principles of Art and Design” are used to similar effect (see Resources). Many classroom teachers rely on visual support as a point of reference throughout a school year, so it can be helpful remind them of the range of expressive options they can use to support their facilitation of arts integrated experiences. Arts Standards: Many versions of arts standards are available to the teaching artist—some specific to the district being served, and others more generally applicable. The National Core Arts Standards are a general framework for teaching the arts that extend into all the domains of arts learning discussed above. They are organized into the strands of Creating, Performing/Presenting/Producing, Responding, and Connecting. For teachers who use a standards-based approach to lesson and unit design, standards help communicate the essential knowledge and skills of creating quality work in each discipline, according to the age of the child. Standards can also support conversations about art, and connections with art. Art Making: There may be nothing more motivating than a successful art making experience (see Experience). Teachers’ feelings of personal efficacy is greatly increased when he or she has had a successful experience with the subject matter. This efficacy leads to better outcomes for students (Prothero, 2008). The teaching artist supports teacher efficacy through simple (but specific) acknowledgment of teachers’ efforts, accomplishments, and growth over the course of a PD experience. In addition, classroom teachers experience a burst of confidence when they hear peer audiences respond positively to their art-work. Explicit Instruction: Some teaching artists have found success teaching the key terminology of their art form through direct instruction, as a classroom teacher would teach any list of content-specific words. Of course, the teaching artist can employ several tricks to capture the imagination while modeling and facilitating guided practice. Visual, physical, and audio representations of new information help make language concrete while exposing participants or students to art along the way.